As the demand for natural gas vehicles (NGVs) grows in everything from passenger cars to rail, so does the need for the supporting refueling infrastructure. In North America, the natural gas fueling landscape is expanding to accommodate the some 137,205 and growing NGVs on Canadian and American highways (NGV Global 2011). NGV owners have increasing options for fueling their vehicles including public and private compressed natural gas (CNG) and liquefied natural gas (LNG) stations, depot-based stations with slow-fill options and at-home refueling appliances that attach to a homeowner’s natural gas line. According to the Canadian Natural Gas Vehicle Alliance (CNGVA), Canada currently has about 40 public CNG fueling stations and a small handful of public LNG stations from B.C. to Quebec. According to the Department of Energy’s Alternative Fuels Data Centre, (DOE), the U.S. currently has approximately 602 public CNG stations and 33 public LNG stations. The total number (about 675) of public natural gas fueling stations across Canada and the U.S. doesn’t include the number of private depot-based refueling stations used by fleets, government vehicles and heavy-duty truck owners. With these, industry organizations estimate 1,311 for both private and public CNG and LNG stations across the two countries. These numbers may seem small in comparison to the upwards of 150,000 gasoline stations across the U.S. alone, but it’s the rate at which natural gas stations are popping up that’s impressive. A few of the industry leaders are working to propel the development of new fueling infrastructure in response to the significant rise in NGV adoption. Public Relations Manager at Clean Energy Fuels Patric Rayburn says refuse, transit and airport/shuttle fleets have been the largest adopters of natural gas fuel for transportation and the heavy-duty trucking sector is now gaining momentum in its transition to the fuel. 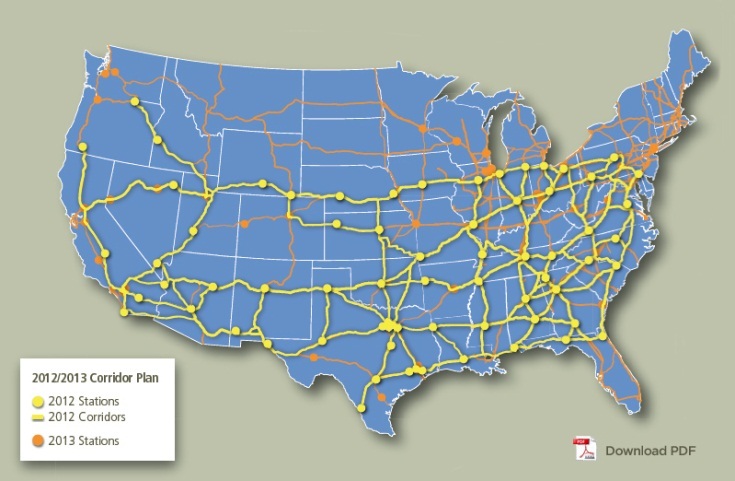 Clean Energy's Natural Gas Highway. these stations are located at Pilot-Flying J locations and with the first phase of ANGH completed in 2012, their aim was achieved. “Last year we built 70 new ANGH stations and we plan to build another 30 to 50 stations by the end of 2013. We’re ready to support heavy-duty trucking’s continued transition to cleaner and cheaper natural gas,” Patric added. To ensure there is a sufficient LNG supply for the new stations, Clean Energy operates two existing LNG plants and is purchasing two natural gas liquefaction plants from General Electric Oil and Gas (GE) featuring its Micro LNG technology; these are slated to come online in 2015. Other LNG expansion projects include Blu LNG’s target to build at least 50 LNG fueling stations for trucks across the U.S. Shell and TravelCenters of America LLC’s (TA) have also announced they are working together to construct at least two LNG fueling lanes at up to 100 of their existing stations across the U.S.
CNG’s presence at American fuel retailers is also growing thanks to GE and Chesapeake Energy’s 2012 announcement to build more than 250 CNG fueling units aptly named, “CNG In A Box”. The eight foot by 20 foot plug-and-play style containers are designed to simplify and expedite the fueling process for both retailers and NGV owners. The units can be set up wherever there is a natural gas pipeline as they come ready to go with all of the necessary compressors, motors and dispensers. To enhance the convenience of owning a natural gas vehicle, GE along with companies such as Eaton Corporation and BRC FuelMaker, maker of the “Phill” home fueling device, are working to improve the design and affordability of at-home fueling appliances with target prices around $500. The appliances connect to the homeowner’s natural gas line and power outlet and can be left overnight to fill a vehicle with CNG. The companies’ efforts are backed in part by varying funding from the U.S. Department of Energy as it pushes to make the transition to natural gas vehicles more appealing. 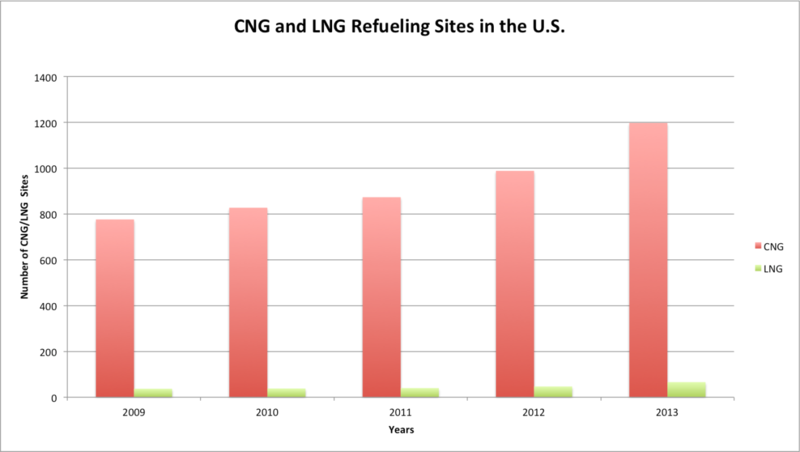 Canada’s natural gas fueling landscape saw progress in March 2013 when Shell Canada and Flying J opened Canada’s first public LNG refueling station in Calgary. The station’s LNG supply will come from a Shell production facility west of Calgary. By the end of 2013, Shell aims to have this facility supply the first three public LNG Shell Flying J LNG truck stops in Calgary, Red Deer and Edmonton. From peppering major freight trucking corridors with LNG stations to developing domestic CNG fueling appliances, the growing prevalence of fueling options is tackling one of the main hurdles that’s been delaying the adoption of NGV’s from consumers and fleet owners alike.